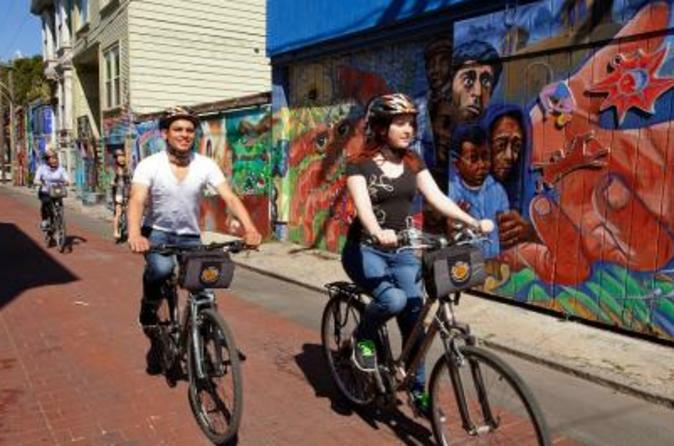 Combine a San Francisco bike adventure with admission to Alcatraz Island on this two-part tour. First, cruise to Alcatraz by ferry, and explore the island prison independently on a self-guided walking tour with a personal audio guide. Then head to Fisherman's Wharf to start your selected 3- or 4-hour bike tour — a ride across the Golden Gate Bridge, a tour of the city streets or an evening tour that ends in the Presidio. This combo tour takes place over two days. Head to Pier 33 to board the Alcatraz ferry, which takes you across San Francisco Bay for sweeping views of the city and the Golden Gate Bridge. When you arrive on Alcatraz Island, start your self-guided walking tour of the legendary federal prison. Slip on a provided headset, and listen to award-winning narration as you explore the cell block; you'll hear stories of infamous inmates such as Al 'Scarface' Capone and 'Birdman' Robert Stroud. Look into prison cells, and learn about life in one of the world's most notorious penitentiaries. You can spend as much time as you like on the Rock before returning to San Francisco on the ferry. When booking this tour, choose from three bike tours: Streets of San Francisco, Waterfront and Golden Gate Bridge, or Evening Waterfront and Golden Gate Bridge. All three bike tours depart from Fisherman’s Wharf, where you'll be outfitted with a bike and helmet. Follow your guide at a leisurely pace over mostly flat terrain; each route is customized with off-the-beaten-track spots that only a local would know, with plenty of stops for photos and to hear about San Francisco sights. The 24-gear hybrid bicycles come with a front handlebar bag and rear gear rack, as well as a lock and route map so you can explore further on your own with the included all-day bike rental. If you'd like an easier experience with less pedaling, you can upgrade to an electric bike (additional expense). See below for descriptions about each bike tour. Special Offer - Save 27% when you travel through May 15, 2018. See pricing options for full details. - Book Now!